All families who need to fill out the District's Free and Reduced Lunch Application can now do so online. Simply click on the heading of this article and it will take you directly to the link, then begin the application process. It is not tied into Aeries Parent Portal. If you haven't already created and account, use the Create New Account tab. If you have any questions, please feel free to call the school. On Tuesday September 18, all students will take a photo ID picture from Lifetouch Studios. There is an opportunity to order pictures through Lifetouch either the day of pictures, or online. Lifetouch has a variety of background options and packages suitable for each family. Purchase of pictures is not required for students to receive a school ID. We are inviting all Del Mar parents and families to get involved in our school through the School Site Council (SSC). SSC is a group of family members, staff and community members who meet once a month to determine how the school will function and spend available monies. Parental involvement is a critical component of the SSC make-up. In your summer mailing packet you received nomination forms to nominate yourself or someone else for School Site Council membership. We meet on the fourth Wednesday of each month at Del Mar at 2:30. We are usually done by 3:30. If you would be interested in becoming a SSC member, please call Mr. Sellers at school. The 2018 Graduation Photos have been uploaded. Go To the "Photo Album" tab. Click on Graduation 2018 tab. You are free to copy and paste to your own files. Congratulations to Scholarship and Award Winners! 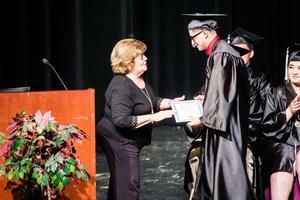 On Thursday June 6th we graduated 28 Seniors, 2 Juniors and 1 Students from our Adult Transition Class. A graduation crowd of over 300 filled the Gary Goodson Theatre at Gabrielino to see their son/daughters finish their high school career on the stage. 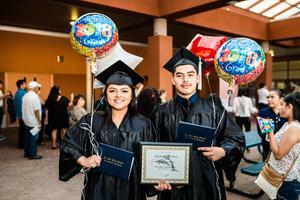 School Board President Ms. Cristina Alvarado and Superintendent Dr. John Pappalardo sent the class of 2018 off into the world as graduates. Congratulations class of 2018! We will miss you! Del Mar History Day Student Sergio Landeros Finishes in the top 10 in California! Congratulations to Del Mar student student Sergio Landeros who competed this past weekend in Sacramento in History Day. Sergio was one of three finalist from Los Angeles County who qualified for the State competition. Students from all over California came to represent their counties. Sergio did well enough to advance to the Sunday finals as one of the nine California Finalist! Sergio is the first Del Mar student to make the Sunday final. We are all so proud of Sergio, Mrs. Kloster and the entire History Day Team. On Friday April 27th, the Del Mar staff attended the State Conference for continuation schools and received its third consecutive "California Model Continuation High School" award. Del Mar was one of 32 of the over 500 continuation high schools in California to be named Model School this year. 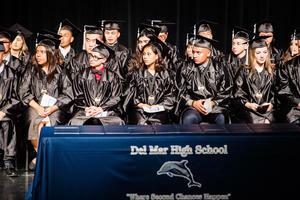 The honor is for a 3 year period and this will mark 9 consecutive years Del Mar has been a Model School. We thank everyone who works with our students and school community. It would not be possible without all of the support we receive from the Governing Board and District Office, families and community of San Gabriel. Thank you all. On Wednesday March 14th, Del Mar students and staff participated in the national "#Enough" walkout to protest gun violence. Our students used their First Amendment rights to stand beside students on a national level to express concern and frustration regarding school mass shootings. Students and staff walked around Smith Park and back to school in exactly 17 minutes honoring the 17 victims of the shooting in Parkland Florida. Please click on this article heading for more pictures. On Tuesday February 13th, Storyteller Diane Ferlatte performed for the students at Del Mar. Ms. Ferlatte, accompanied musically by Mr. Pearson, told stories of United States history that involved African American slaves and their significant contributions to our countries development and establishment. Her "We Were There", "stories about ordinary African Americans who did extraordinary things" performance was enlightening and informative to our students and staff. With period music from Mr. Pearson, it was a great experience for our students. We thank The San Gabriel Education Foundation and Mrs. Anguili and The Music Center of LA County for bringing Ms. Ferlatte and Mr. Pearson to our campus. It was truly a once in a lifetime opportunity.